Traditionally, opening weekend in Yellowstone coincides with Memorial Day weekend. And while that weekend marks some momentous seasonal openings—including the Beartooth Highway, which connects northeastern Yellowstone to Red Lodge, Montana—most of the park’s main visitor facilities open prior to then. While most of Yellowstone’s major facilities (like the Old Faithful Inn) won’t reopen for the season until May, if you plan a trip into the park, you won’t need to stock up on supplies beforehand. If you’re going to be in Yellowstone National Park this weekend, here’s what facilities will be open. Canyon General Store (April 20): Part store and part restaurant, the Canyon General Store is an excellent destination for all park travelers. The grocery includes both readymade meals and on-the-go stuff like fruit and trail mix. If you’re looking for a sit-down meal, consider heading over to the diner, which offers 1950s staples like hamburgers and milkshakes. Canyon Visitor Education Center (April 21): The Canyon Visitor Center features exhibits on Yellowstone’s geologic and volcanic history. The centerpiece of the education area is its room-size relief model of Yellowstone National Park, with information about how volcanic eruptions, glaciers, and earthquakes have shaped Yellowstone’s landscape. Other volcano-themed exhibits include a gigantic lava lamp and a rotating kugel ball showcasing global volcanic hotspots. Albright Visitor Center (open all year): The Albright Visitor Center is part museum, part ranger station/backcountry office. Built in one of the old Army barracks, the Visitor Center is named for legendary Yellowstone superintendent Horace Albright, who brought a sense of Jazz Age suavity to the role during his tenure (1922-29). He later served as director of the National Park Service from 1929 to 1933. The museum exhibits center on Yellowstone’s wildlife. There’s also a bookstore operated by Yellowstone Forever. Mammoth General Store (open all year): Since both the Mammoth Dining Room and Terrace Grill will be closed until April 27, the General Store is the only place in Mammoth where you can find some grub. If you’re on the go, we recommend getting a hot dog or two, followed by some Wilcoxson’s Ice Cream. Mammoth Campground (open all year): One of the largest campgrounds in Yellowstone, and the only one open year-round, Mammoth is situated in a lovely spot, surrounded by sagebrush and the occasional juniper tree. From June to mid-September, the NPS hosts ranger programs at the amphitheater. If you want to camp this opening weekend, be warned: it’s first-come, first served. Mammoth Clinic (open all year, with exceptions): You can never be too careful in Yellowstone! If you have an emergency, please call 911. Otherwise, you can contact the clinic by calling 307-344-7965. The clinic is closed holidays (New Year’s Day, Memorial Day, Thanksgiving, and Christmas) and is also closed weekends between September 28 and May 31. Old Faithful Snow Lodge Geyser Grill (April 20): The Snow Lodge’s Geyser Grill offers lunch and dinner and has a wide variety of items on its menu. It’s the perfect place to grab a burger or a sandwich before hitting the boardwalks. Old Faithful Visitor Center (April 21): The Old Faithful Visitor Center is located between the Old Faithful Inn and Lodge—with a choice view of Old Faithful geyser. This visitor center focuses on Yellowstone’s hydrothermal features—its geysers, hot springs, fumaroles, etc. It’s a cool place to learn about all the things you can see out in the Upper Geyser Basin. Besides the main exhibit, there’s also a “Young Scientist” area featuring hands-on exhibits—including a scale model of a geyser. This Visitor Center is also the place to see when geysers in the basin are predicted to erupt. Most of Yellowstone’s interior roads will remain closed for the rest of April, limiting what you can see when. This weekend, for instance, you won’t be able to drive from Old Faithful to West Thumb, or from Canyon to Lake. You won’t be able to go from Tower-Roosevelt to Canyon, either. Both the East and South Entrances remain closed. Weather in Yellowstone can change on a dime. Dress appropriately—in layers—and be prepared to turn around if the weather gets hairy. You should do the same on any hikes or boardwalk trips. If you’re planning to go geyser gazing, bear in mind that some boardwalks/trails may still be snowy. Exercise caution and don’t take any oversnowed boardwalks/trails. You should be mindful of wildlife. 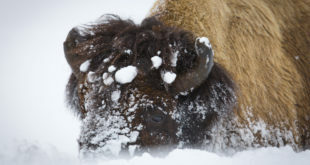 Bears started reemerging from hibernation in March and it’s calving season for bison, which means cows will be extra protective of their red dogs. Park policy states you should stay at least 25 yards away from wildlife like elk and bison; you should stay at least 100 yards away from wolves and bears. Be especially careful on the roads. Remember: the speed limit is 45 mph. And be prepared to wait out a wildlife jam. Facilities and roads in Yellowstone National Park will continue to reopen between now and early June. Read here for the full list of opening and closing dates. For updates on Yellowstone’s roads, check out our Road Conditions page.